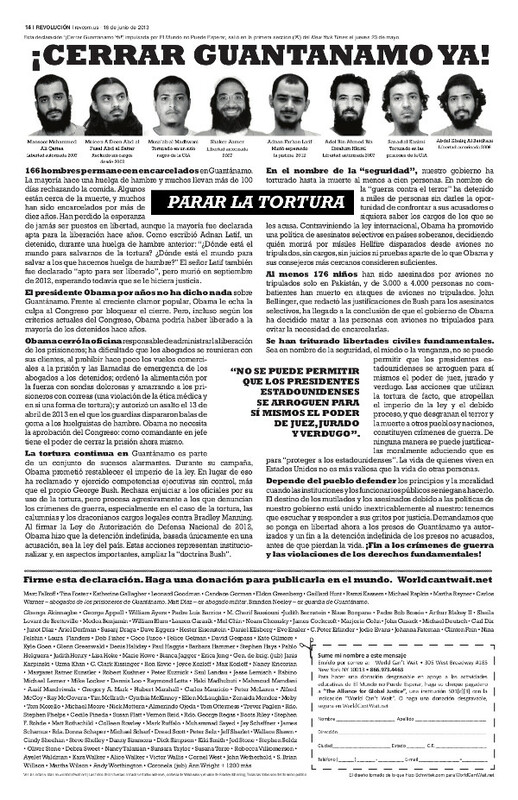 Tendremos la oportunidad de entrevistar al Mohamedou Ould Slahi, el autor de Diario de Guantánamo. Aunque tenemos algunas preguntas que quisiéramos hacerle, pensamos que podríamos abrir la convocatoria para darles la oportunidad de mandarnos las que ustedes quisieran que le hiciéramos. Así que manden un DM a doc1tech Nat en Twitter o ed charles o Natalia R Scott en Facebook o vía correo electrónico a espagnol@worldcantwait.com. Las preguntas pueden ser en inglés o en español. We have learned that we have a chance to interview Mohamedou Ould Slahi, the author of the Guantánamo Diary. While we have some questions that we have to ask him, we thought that we should open it and give you all the chance to ask him yours. So DM either doc1tech or Nat on twitter or ed charles or Natalia R Scott on Facebook or send them to WCW Spanish email address at espagnol@worldcantwait.net. The questions can be either in English or Spanish.